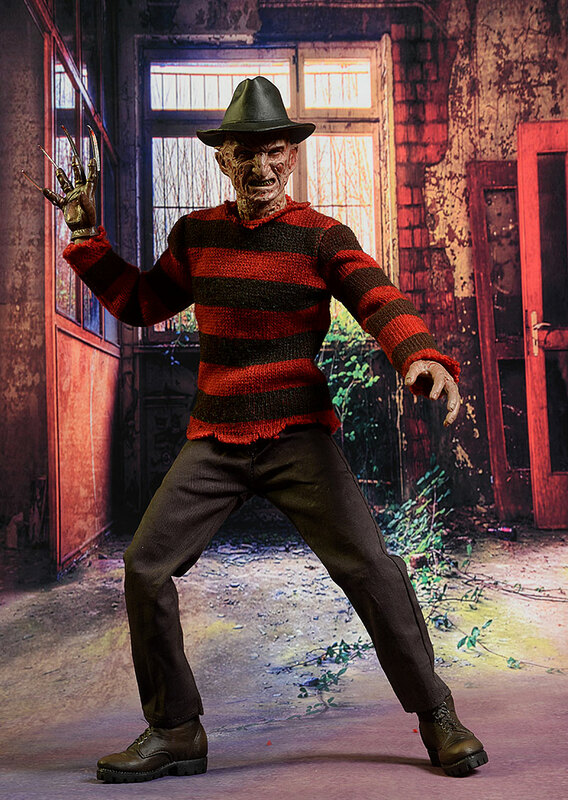 Sideshow has produced sixth scale figures based on the property in the past, but it's been a long time since their last release, and much has changed in the industry. 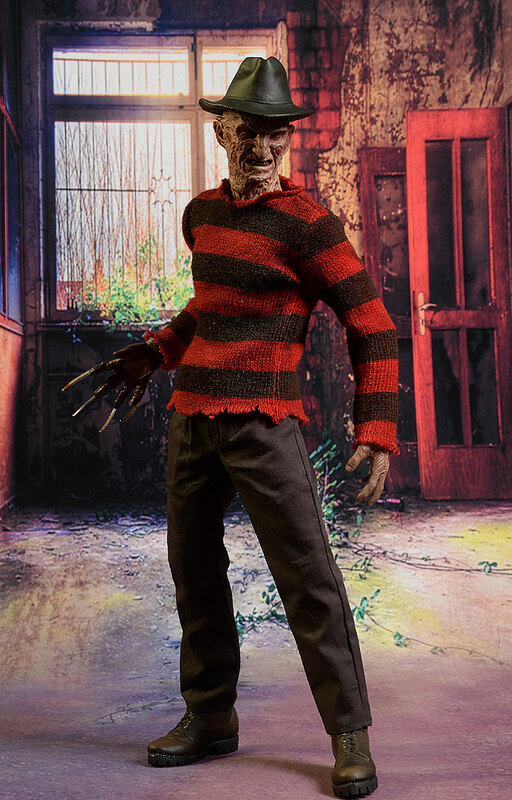 Not too long ago they gave us and updated Jason, and now Freddy has hit the shelf to join his old buddy. 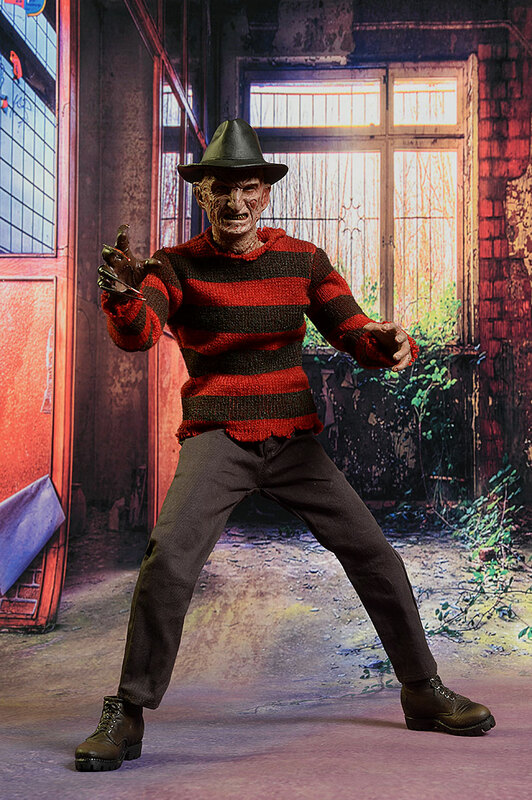 This Freddy is based on NOES 3 - Dream Warrior, but only the serious fan will pick up on the differences. There are two versions, the regular release and the exclusive, which includes one additional accessory. I'm looking at the exclusive tonight, and I'll point out the single difference when I get to that section. Either version will run you about $200, depending on the retailer. The graphics are particularly nice on this release, and I like the flaming furnace inspired background on the cover. Everything is collector friendly of course, and Sideshow has added a cigar band too, but this one is wrapped around the plastic trays inside. I don't love it, since it can be difficult to remove, but I'm betting it provides some additional safety in transit. 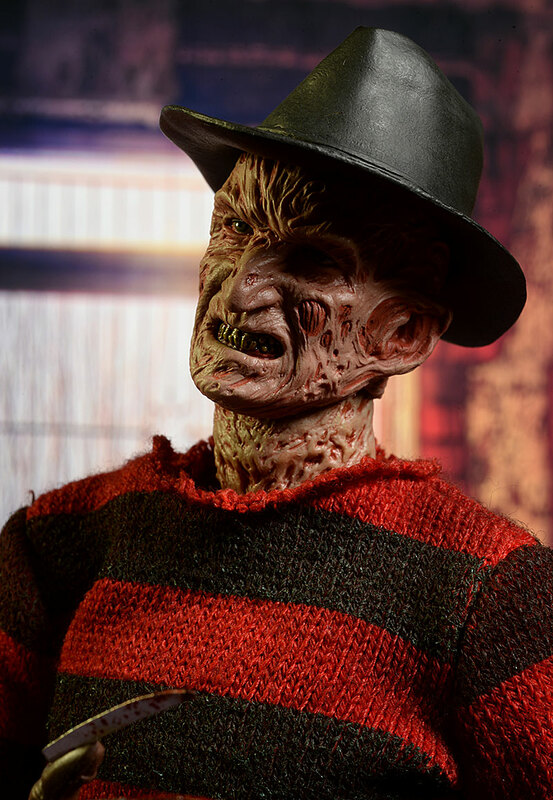 While the overall look of Freddy is pretty recognizable, this sculpt captures the heavily burned, scarred, exposed version of him from the third film. The work on the face and neck is excellent, with lots of realistic detail and texture. There's plenty of evil emotion in the gritted expression, and the work on areas like the teeth, eyes, and scarred ears gives him plenty of realism. The neck and head are quite seamless in appearance, although they are two separate pieces. See, you don't have to do a one piece head/neck sculpt to get a great looking portrait! You just have to do a two piece well. The various left hands are sculpted to match the damaged skin on the face and neck, while the gloved rights have real metal blades. The various poses that the hands are sculpted in look great and work with lots of different overall stances. So why only a 3 star rating? Because I had two issues, both minor, but enough together to pull him down. First, the hat is permanently attached. I get it - it's easier to create a great looking hat in proper scale when the head is designed for it to be a permanent addition, but I still prefer a separate hat...or two portraits, one with the hat and one without. My second issue is actually the bigger one, but it's exacerbated by the permanence of the hat. The hat is placed too far up and back on the head. Check out the LifeSizer photo above, and you'll see I have him posed as though he's pushing his hat back. It's the pose that looks most realistic, thanks to where they affixed the chapeau. I know some folks have managed to remove the hat, worked on the head and interior, and got it to sit lower on the forehead. That's great, but ignoring the fact that you shouldn't be forced to do it, I have another suggestion. If you look at how the hat looks in the photo on the box cover, you'll see the front of the brim dips down a bit over the forehead. The sculpted hat brim does not. I'm thinking about softening the brim up a bit with some heat, and creating the deeper dip myself. 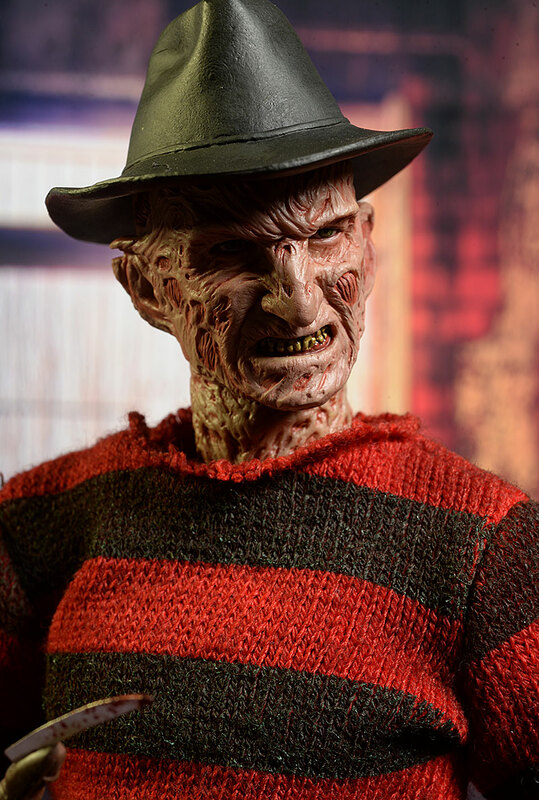 Sideshow has been improving their production paint operations for some time now, and Freddy continues the upward move. The coloration of scarred skin and exposed muscle looks great, and the other details - particularly the teeth, gums, and eyes - are excellent. There's some smaller details on the boots as well, and the wear work there looks quite realistic. I think the hat is a bit plain, and some of that worn, aged paint work that we see on the boots would have really helped the hat look less dull, but it's a pretty minor nit overall. 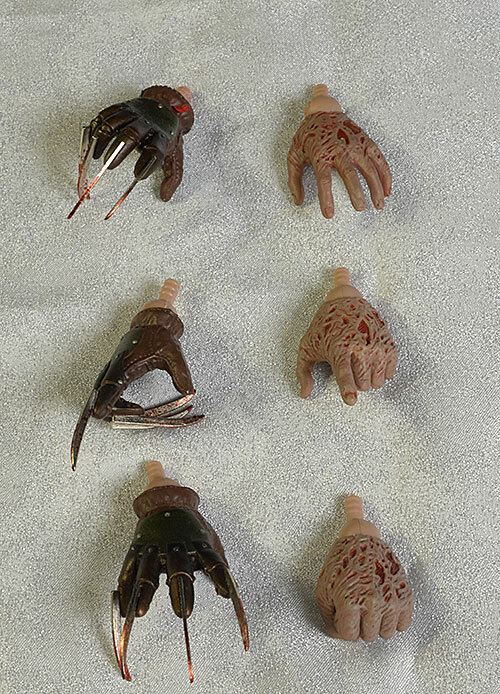 The gloved hands look good, especially with the blood added to the blades. I almost went four stars here - this is one of the best outings for a Sideshow body I've seen. Everything is tight and smooth, and you can easily create natural, flowing poses. A big reason for this is the two joints at the neck, one at the jawline and the torso. Even better, the joint at the torso is cut out at the front, allowing the neck to dip forward and the head to tilt back. This is perfect for hunched poses, and allows you to add a realistic tweak to just about any stance. The rest of the body has all the usual joints, and they are tight enough to hold dynamic poses long term. The ab crunch is another positive, working with the rest of the body to create dangerous stances. The hands swap easily, and there's a wrist post for every one. My one complaint, and it's a minor one, is that the rocker movement in the rotating hinge ankles is a bit restricted by the boots. Yea, it's nit picky, and it really was the only issue I had with an otherwise excellent body. He's pretty short on extras, but what he has are well done. And what he has is hands. There are six in total with the exclusive release - on the left, a fist, a pointing finger, and a splayed pose. On the right, the regular release comes with a splayed glove, and one with the last two fingers bent in a bit more. The exclusive includes the special right hand with the pointing bladed finger. As I said earlier, these swap easily. The blades are all metal, and look terrific. Scale is good, and the painted blood stains work. His only other accessory is the included display stand with crotch support. It's pretty basic stuff, but a nice addition for consistency. 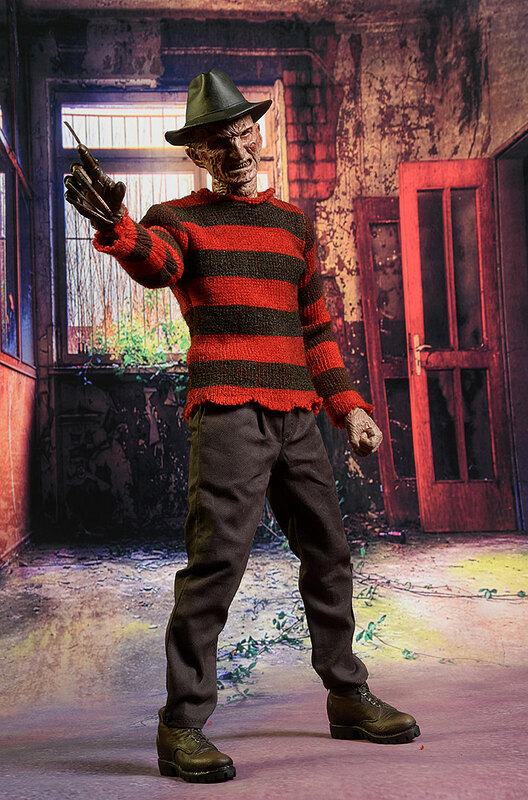 This is a pretty basic outfit, and got more basic when the made the hat part of the head sculpt. The work boots look great, with an excellent sculpt and paint job. The brown pants are, well, brown pants, but they are well tailored with a reasonably realistic fit. 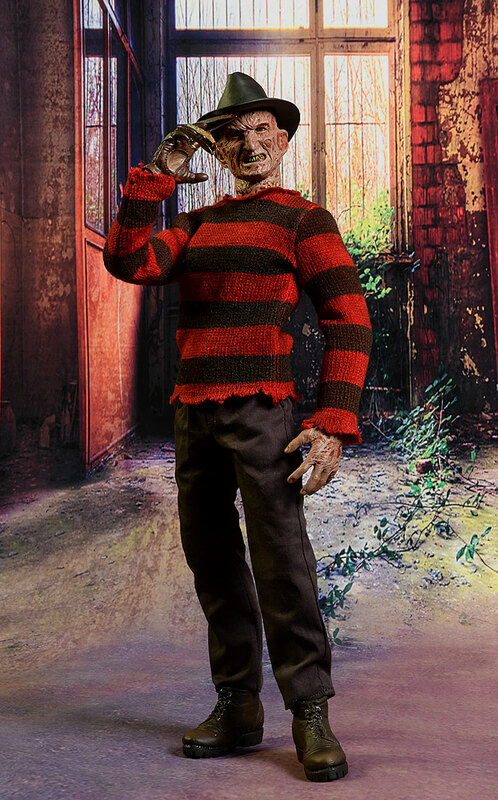 Of course, the most critical aspect is the black and red striped sweater, with frayed and worn edges. It's hard to see in photos, but there's actually a dirty, rough look and feel to the final product, perfect for the character. It's a solid outing, but it's pretty basic stuff. Has they managed to do a separate hat in scale, I would have been more inclined to go another half star here. Thanks to the terrific articulation, you'll have plenty of fun posing this guy. A few more accessories would have gone a long way to getting that extra half star, but there's no doubt that this is a figure you visit and re-visit in your display. Two hundred bucks isn't a lot of money on the high end sixth scale market, but it's still a pretty hefty chunk of change when the only extras are a few hands. Yes, I appreciate the fact that the blades are metal, but a second portrait (to solve the hat issue) should have been possible at this price. Those metal blades can fall out of the slots on the fingers - watch for it so you don't lose one. They pop right back on (and you can re-glue them too), so it's not a major issue, but worth paying attention to when you're handling him. This guy could easily be a ***1/2 figure - easily. Fix the placement of the hat on the head, provide a second portrait without the hat (or alternatively, drop the price to $180), and you're done. That's not to say that this isn't a terrific figure - it is. 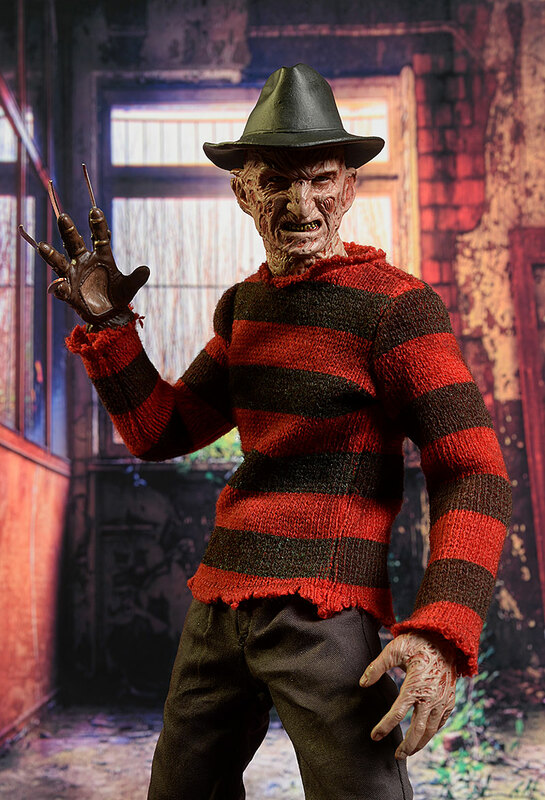 It's a much needed replacement to the old Freddy's on your shelf, and he'll fit in terrific both with the new Jason, and with newer figures from other companies. But when you make the hat a permanent part of his portrait, the placement has to be perfect. I can guarantee this will be the one issue of contention for most people, more so in hand than in photos where shadows and lighting can make it less apparent. 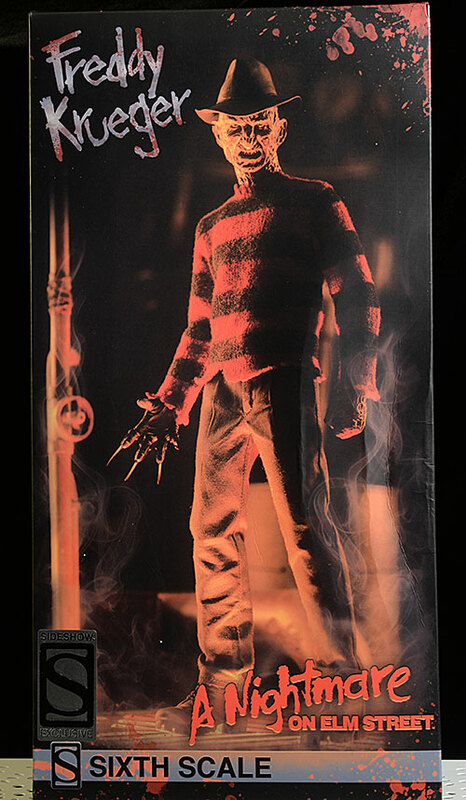 - of course, Sideshow is the place to pick up the exclusive, where he will run you $200. Since he's still available, I'd go this route. - also has him at $200, but it's the regular release of course. - also has te regular release for $200. 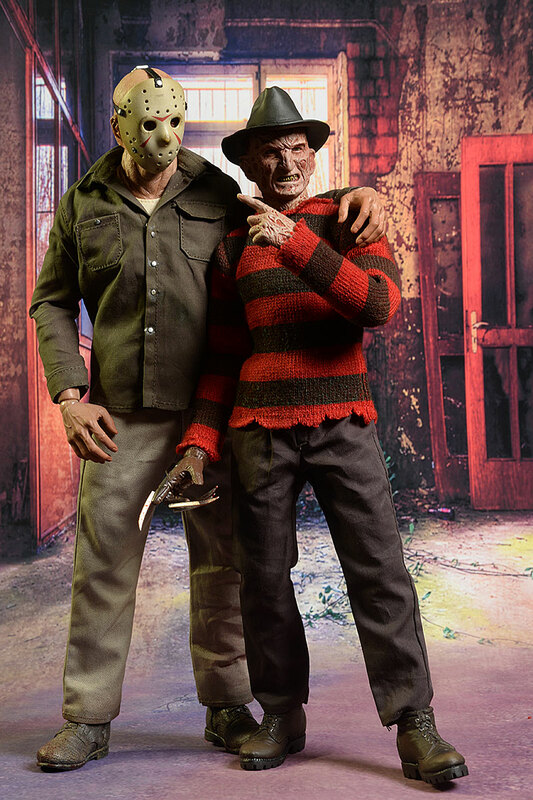 I just recently covered the new Sideshow Jason - he's the one with Freddy in the photo above. 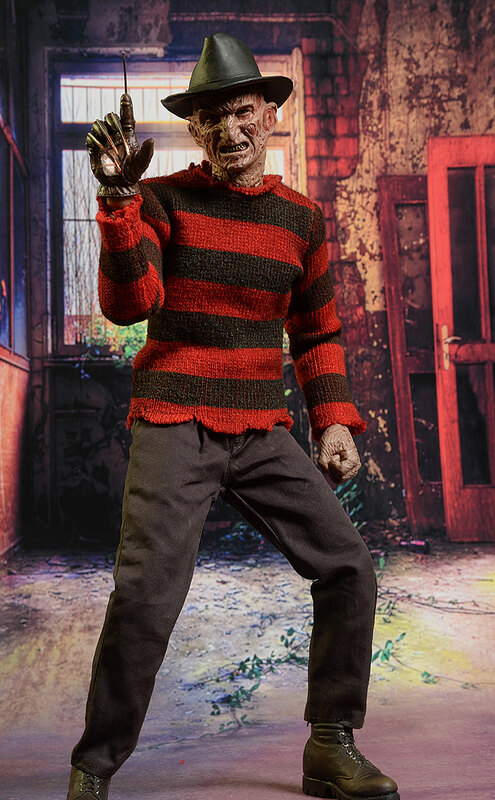 This isn't the first time Sideshow has done Freddy, including the New Nightmare version, one based on the original film, and a Freddy vs Jason version. 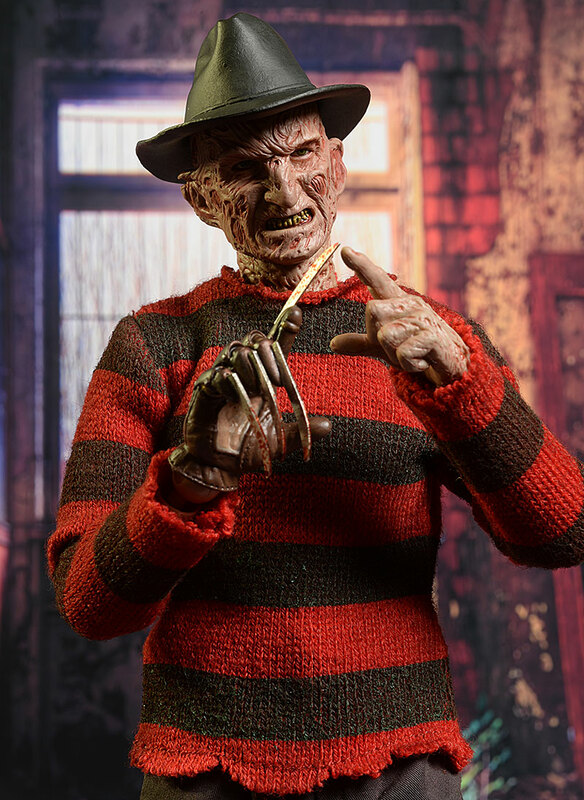 They even did a Robert Englund version!